Watch HandmadeInVermont.com's owner Christopher Dunigan as he walks you through the Hubbardton Forge Lighting Shade options. Hubbardton Forge has designed beautiful lampshades to compliment their handcrafted lighting. All shades have an inner lining of heavy white plastic to ensure years of enjoyment. Remember some shapes will be limited to certain fabrics and papers. This section will help you choose the shade right for your needs. NATURAL LINEN: A more traditional natural color fabric option with a coarser weave compared to our Natural Anna and Flax fabrics. NATURAL ANNA: A more contemporary, white fabric with a tighter, smoother weave compared to the Natural Linen. FLAX: Our most popular transitional, off-white fabric with the same weave as on our Natural Anna shade. DOESKIN MICRO-SUEDE: Softer, richer fabrics, our micro-suedes are hand-dyed and distressed to create a subtle patterning with warm brown and tan overtones, especially when lit. LIGHT GREY: A subtle nuance of grey, warmer in hue when lit. Textural qualities similar to a refined linen weave. MEDIUM GREY: A neutral cool grey, with textural qualities similar to a refined linen weave. SPUN FROST: A white, non-woven fabric imparts a light, contemporary feel. SPUN AMBER: A warm, amber alternative to the Spun Frost non-woven fabric. 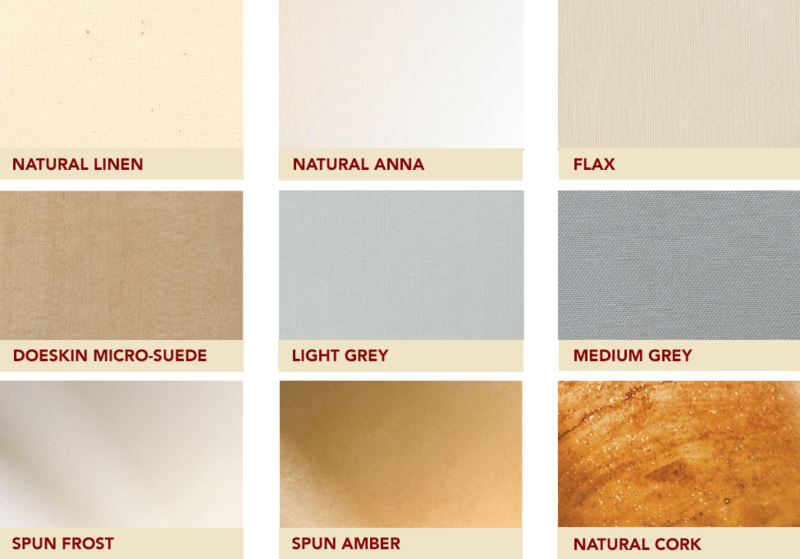 NATURAL CORK: A renewable natural cork veneer which glows dramatically when lit.